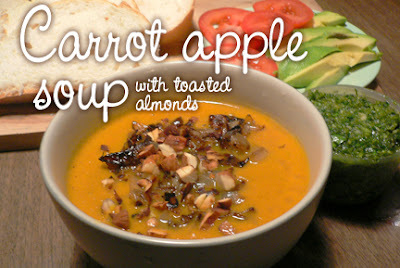 A completely different taste sensation from the Carrot Coriander Soup, this recipe is originally from Epicurious.com (I've modified it a bit) and has a wonderful apple flavour with a great texture from the crunchy almonds sprinkled overtop. Cook shallots, bay leaf, ginger, curry powder, and thyme in oil in a heavy saucepan over medium heat, stirring occasionally, until shallots are softened lightly browned, 6 to 8 minutes. Add carrots and potato or squash to the pot, then add broth, cider, water, salt, and pepper and bring to a boil. Reduce heat and simmer, covered, until carrots are tender, around 30 minutes. Discard bay leaf. Puree soup in 2 batches in a blender, or using a wand-style blender, until silky smooth. Add more water or apple cider if you'd like to achieve a thinner soup. Serve with a squeeze of lemon and sprinkled with almonds. Serves 3 to 4. NOTE: This is a very smooth soup, but if you like more texture, reserve some of the chopped carrots before blending the soup, and fry some extra shallots or onion in olive oil, and stir into the blended soup or dollop overtop (as seen in the photo above). To make it a larger meal, serve with bread, tomatoes and avocadoes, or a slice of frittata. This soup is amazing! It's warm, beautiful, and so soothing. To suite my tastes today, I added a bunch of toasted cashews with the sliced almonds and a tablespoon or two of tahini, though honestly, the soup is divine as is.